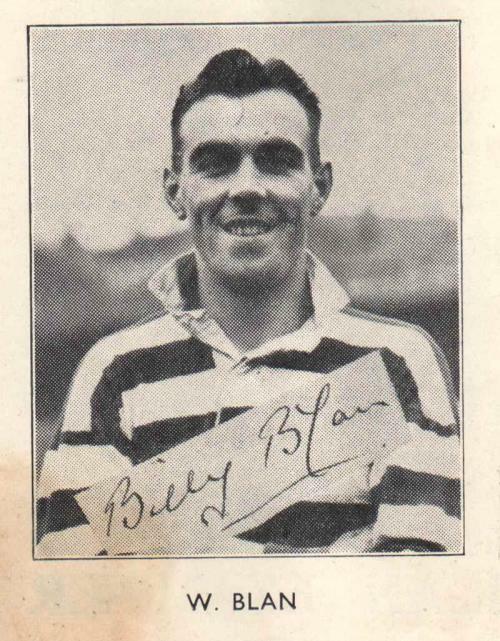 We've learned over the weekend of the sad passing of another Wigan legend, Billy Blan has died 86. He was not only a top rugby league player for Wigan but also a war veteran having been in the RAF during the Second World War. Billy was one of three Blan brothers who attempted to make the grade at Central Park. Elder brother Jack would for a spell play alongside Billy in the dominant Wigan side that won 3 league titles, 2 challenge cups and 5 Lancashire Cups in the post war years. His younger brother Albert played for Wigan's "A" side but never made the first team and eventually left to join Swinton were he apparently became an ace goal kicker. On returning from his war efforts Billy joined Wigan and made his debut in the 6th match of the 1945-46 season - a 10-9 October away win at Barrow. He played loose forward and ironically it was brother Jack who's place his took. That though would only be a one off appearance as he wouldn't get another chance until April. Wigan were having a great season. They had reached Wembley and were on course to finish top of the table - which would easily earn them a top 4 play off spot. But just as the business end of the season was looming Wigan had to lose four star players. Joe Egan, Ken Gee, Martin Ryan and Ted Ward all departed to make the long journey to Australia to tour with Great Britain. No flying in those days, they had to sail - which took weeks. It would be the absence of Ken Gee that would give Billy his chance. He went on to play 7 of the remaining 8 matches of the league campaign and scored three tries in that run including his first two tries for the club in a 35-5 home win over Workington. Wigan went on to finish top of the table which qualified them for the top 4 play offs - which decided the champion team, just like today's modern Grand Final. So having played in just 8 matches all season Billy was now in a side aiming to win "all four cups". That was the Grand Slam of the day and consisted of the League, Challenge Cup, County Cup and County League trophies. Only three sides (Hunslet, Huddersfield and Swinton) had previously achieved the feat, which highlighted just how difficult it was to do. Wigan had already won the Lancashire League and Cup so Wembley would be the next step. At Wembley they met Wakefield and the day would end up being a bit of a killer. Wigan lost 13-12 to a 79th minute penalty goal which came off the back of a controversial obstruction call against Wigan. The agonising defeat at the death would leave painful memories for winger Brian Nordgren. First choice goal kicker Ted Ward was touring with GB so Nordgren had the goal kicking duties. He had 7 attempts at goal in that final and missed the lot. If he had kicked just one of them Wigan's "all four cups" dream would have lived on. All the more harsh for him as he had scored 2 tries on the day. For Billy, playing in only his 9th game, that must have been a choker. Wigan though had to pick themselves up and in the play offs they met Bradford at Central Park. They comfortably won 18-4 to set up a final with Huddersfield at Maine Road. Wigan won 13-4 and Billy had won his first medal in only his 11th match. The next season Billy became a regular in the side, playing either second row or loose forward, as Wigan retained the league title and Lancashire cup. He played in both finals and contributed 8 tries during 41 appearances. In 1947-48 Wigan would return to Wembley - giving Billy a chance to extinguish the memories of that painful defeat two years earlier. Wigan had, had another strong season, having finished top of the table. But they would be eliminated from the play offs in a shock 15-3 home defeat to Bradford just before the cup final. But like in 1946 they bounced back from one disappointment to end on a high. Ironically it was Bradford who they met again at Wembley a week later. The match was again settled by a 79th minute but it was a score that sealed an 8-3 win for Wigan and Billy had won his first Challenge Cup medal to add to his second Lancashire Cup trophy Wigan had won earlier in the season. Billy played 39 matches and scored 9 tries during the campaign. 1948-49 would see his brother Jack move to Salford but Billy remained at Central Park. Wigan again had a strong campaign, retained the Lancashire Cup and made the play offs. But they would fall at the first hurdle - losing to Huddersfield 14-5 at home. Wigan though did beat the touring Australians 16-11. Billy played 27 matches in this year and scored 3 tries. 1949-50 would prove to be a awesome season for Billy. He had scored 23 tries during his Wigan career to date but in this campaign he scored a massive 34, which was a record haul for a forward. Still well short of Brian Nordgren's 57 but it was enough for him to be second top try scorer. Wigan again retained the Lancashire Cup and Billy scored in the 20-7 victory over Leigh at Wilderspool. They would exit the Challenge Cup early but they made the plays off by finishing top of the table. In the play off semi final they met Halifax at Central Park but despite a try from Billy, Wigan drew 5-5 meaning a replay at Thrum Hall. The replay was won at a canter though and Billy again scored in an 18-2 win. The final was against Huddersfield and Wigan were looking for revenge after the Fartowners had knocked them out of the plays off at Central Park a year earlier. In what was described at the time as "the finest Wigan victory of all time" Wigan cruised to a 20-2 win and Billy would score our fourth and final try. Despite his 34 tries Billy was surprisingly not called up the Great Britain tour down under. His place would go to Dewsbury's Harry Street, and it would prove not to be the first time Street denied Billy. Billy continued to play for Wigan until 1953 but never found that try scoring touch again. His winning medal haul would continue to grow though. He won his fifth Lancashire Cup medal in the 1950-51 28-5 win over Warrington and finished that year with his second Wembley triumph as Wigan defeated Barrow 10-0. Ahead of 1951-52 though Wigan signed a certain Harry Street and Blan's position in the side was under threat. Street became first choice but Blan continued on at the club and battled him for the loose forward jersey. Wigan won the Lancashire Cup for the seventh season in a row but Street was picked ahead of Blan in the final and it was the same situation in the Championship Final that Wigan won at the back end of the year. Another irony though is that early in this season, Blan earned his only Great Britain caps as he played in all three tests against the touring Kiwis. Despite limited appearances Blan stayed at his home town club in 1952-53 but for the first time in his Wigan career - the club had a poor campaign. They finished 11th in the league and went out of the Lancashire Cup early. They did reach the Challenge Cup semi finals but lost 7-0 to Bradford. The poor campaign and not being a regular in the side perhaps is what persuaded Billy to move on from Wigan. He still played 23 matches but was clear second choice behind Street. In truth this poor campaign confirmed that the brilliant side of his era was beginning to get old and break up and a new era, with the likes of Billy Boston and Eric Ashton, was starting to be built. Blan himself was now 31 and moved on for a brief spell with Leeds and later joined arch rivals St Helens where he made 17 appearances at the back end of 1954-55 before retirement. After his career Billy worked in the Central Park pools office until the late 80's, early 90s ish. He served his club well.